Suitable for all metals including aluminium; no neutralisation required. Flushes out flux, swarf, insoluble flux residues, jointing pastes and other installation debris and sludge. Ideal for use prior to application or PC100/101/200 inhibitors. 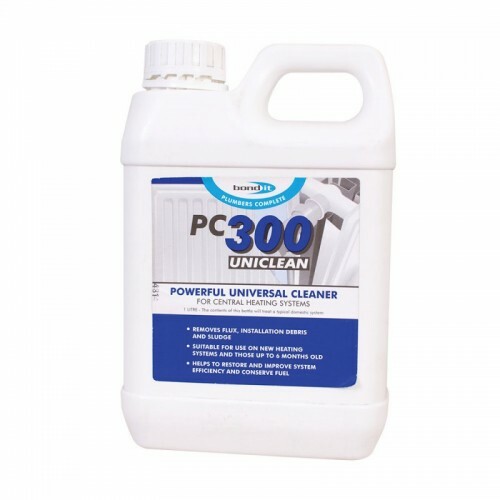 Powerful, heavy duty cleaning agent. Eradicates corrosive flux residues, which could cause rapid pin-holing corrosion of radiators. Eliminates harmful copper deposits being left in the system. Filling the system: Open systems should be dosed via the filling and expansion tank. Adequate draining from a low point is necessary to ensure product enters the system. Closed systems should be dosed via filling loop or a partially drained radiator. If the system is empty add at any suitable point prior to filling. Cleaning: Circulate the system containing the cleaner for at least one hour. Warming the water by running the boiler on low will aid the process. Drain the system at all drain points and then flush through until water runs clear. When re-filling system dose with PC100 or 200 INHIBITOR. Dosage: PC300 should be dosed @ 1% of system for maximum performance. This is the volume of a system with a 14.5Kw Boiler (50,000 Btu/hr). Larger systems will require more cleaner pro rata. Overdosing will not cause any problems or detrimental affects to the system.